People have always been terrified of sharks, of deep water, and of the unknown. Not only are we afraid of predatory animals in general, we're transfixed by them, often prone to weaving stories and fables about them. In a deeply tribal sense, we love our monsters because fascination leads to preparedness, and preparedness usually results in survival. Three of the sharks illustrated have a documented record of killing people. However these animals are highly evolved, as perfectly in tune with their environment as any living thing on the planet. More people are coming to respect and appreciate sharks for what they are: beautiful, graceful, efficient and, above all, an integral part of the marine ecosystem. Grey Morwong are distributed along the south-eastern Australian coastline in continental shelf waters from Moreton Bay in Queensland to Wilsons’ Promontory in Victoria. They are sometimes seen propped up off the bottom on their long pectoral fin rays, which they also use to flick settling parasites of the body. 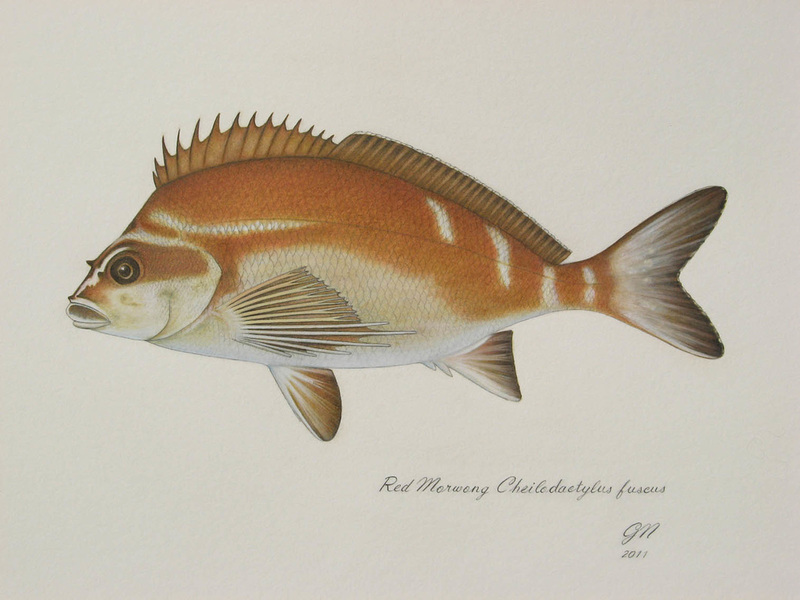 Morwongs are an important part of the fish communities inhabiting SE Australian waters. However, relatively slow growth rates, an extended pelagic larval phase, and complex social interactions make Grey Morwong susceptible to overfishing, with a long-term decline in the average size of landed fish a reliable indicatior of depleting stocks. The Oceanic Whitetip Shark grows up to 3 metres in length and inhabits tropical and warm temperate seas throughout the world. Its stocky body is most notable for long, white-tipped, rounded fins. This aggressive but slow-moving fish dominates feeding frenzies, and is a danger to shipwreck or air crash survivors. Famed oceanographer Jacques Cousteau described the oceanic whitetip as "the most dangerous of all sharks". Recent studies show steeply declining populations because its large fins are highly valued as the chief ingredient of shark fin soup and, as with other shark species, the whitetip faces mounting fishing pressure. Rays are highly adapted fishes and are thought to have evolved from sharks, with most giving birth to live young. Like sharks, many ray species are at or near the top of the marine food chain and they play an important role in the ecosystem. Several Australian rays, including the attractive White-spotted Eagle Ray, are listed as Threatened Species. Rays are particularly vulnerable to entanglement in shark nets, such as those used off popular Gold Coast beaches. Between 1962 and 1988, a total of nearly 14,000 rays were caught in these nets. Rays prey largely on invertebrates and small fish, although many scavenge for food. The ones I have illustrated live in various local habitats ranging from inshore lagoons and estuaries, to well offshore. The fishes illustrated are all fast swimming carnivores that feed on a wide variety of prey, typically hunting for food in packs or following larger carnivores such as sharks and dolphins. Their body shapes tell us much about their lifestyles. These similarly shaped species are adapted for fast swimming, with pointed snouts, streamlined bodies, and deeply forked or ‘lunate’ tails. Nearly all their muscular power is transferred to the tail. Many pelagic (swimming in open seas) species are targeted by both commercial and recreational fisheries, and are vulnerable to over-fishing. 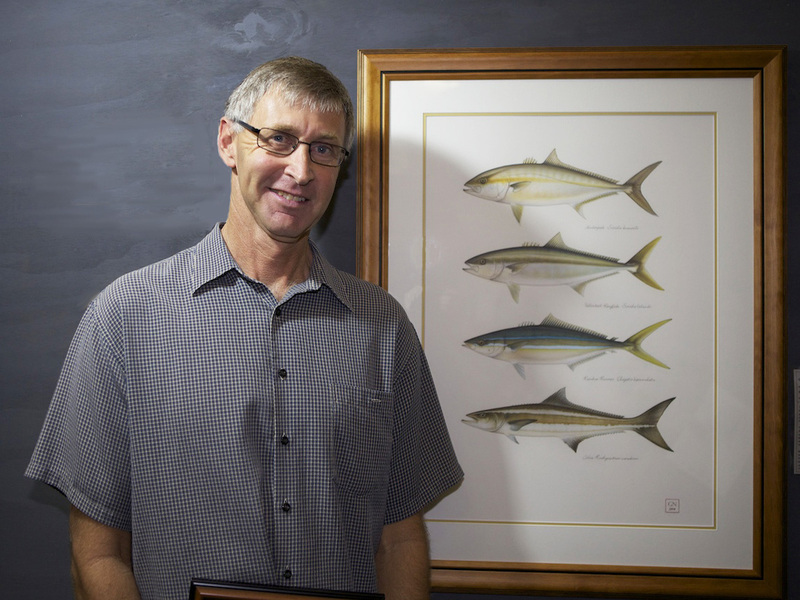 Fishery management to maintain sustainable stocks of these species is essential to help conserve our local marine resources. Red Morwong live within coastal and rocky reefs to a depth of 30m with juveniles living amongst algae on coral reefs. They grow to 65cm in length and are carnivorous, feeding on worms, crustaceans, gastropods and molluscs. Adults have a small pair of horns in front of their eyes. Morwongs are an important part of the fish communities inhabiting subtropical and temperate reefs in Australia. Electronic tracking studies have shown that they are quite territorial, with relatively small home ranges. They live for a long time, with older fish estimated to be 40 years old. Although Red Morwong are difficult to catch using a baited hook, they are potentially vulnerable to overfishing by spearfishers, as they are easy to approach, paying little if any notice to divers. Today, the vital role sharks have in maintaining the stability of marine ecosystems is better understood. Recent declines in populations have often resulted in undesirable side effects on the marine environment. By illustrating some of our lesser known shark species, I hope to increase the awareness and appreciation of these iconic animals. Along the Tweed coast, these sharks occur near river mouths, inlets, mangroves, surf zones, and in adjacent deeper waters. Unfortunately, effective shark conservation measures have often been hampered by the poor public image of creatures viewed primarily as dangerous predators. Besides their important role in maintaining balance in marine ecosystems they are some of the most beautiful, highly evolved and quite simply ‘coolest’ animals in the world. The essential first step in any illustration is completing an accurate pencil drawing of the subject at the same scale as the proposed watercolour illustration. This includes checking and measurement of body parts including relative size and positioning of the subject’s head, eyes, mouth, gills and fins using underwater profile photographs, existing published illustrations, and published anatomical descriptions. Once the pencil drawings are completed, they are carefully transferred onto a sheet of archival paper, checking to ensure correct positioning. Watercolour pencil is then applied in a series of washes, with the lighter colours being applied first. The desired colour is first applied as light shading, with a watercolour brush dampened with water then brushed over the shaded area to evenly distribute the colour across the surface. This is repeated several times so with each progressive application and wash treatment, the colours become gradually deeper. Finally, details including gills, fin rays, eyes and mouthparts are applied using a sharp watercolour pencil.